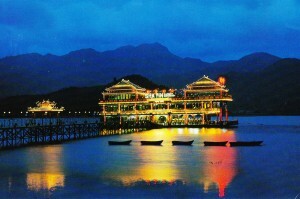 Even though I lived in Hong Kong for five years, I never went to a true floating restaurant. In the early 1960s, my mom ate at Tai Pak Restaurant in Hong Kong’s Aberdeen district, where diners first boarded little sampans and were rowed out to the restaurant, floating in the harbor. Back in the 60s, Tai Pak and the more famous Jumbo were touristy, but I heard the food wasn’t half bad. By the time I got to Hong Kong in 1990, those restaurants weren’t must-sees on the tourist circuit. The food had gotten pretty bad. I recently learned that Shatin, the area where I lived, also had a floating restaurant back in the 1960s (photo on left) and served as another option for tourists in search of an exotic place to dine. 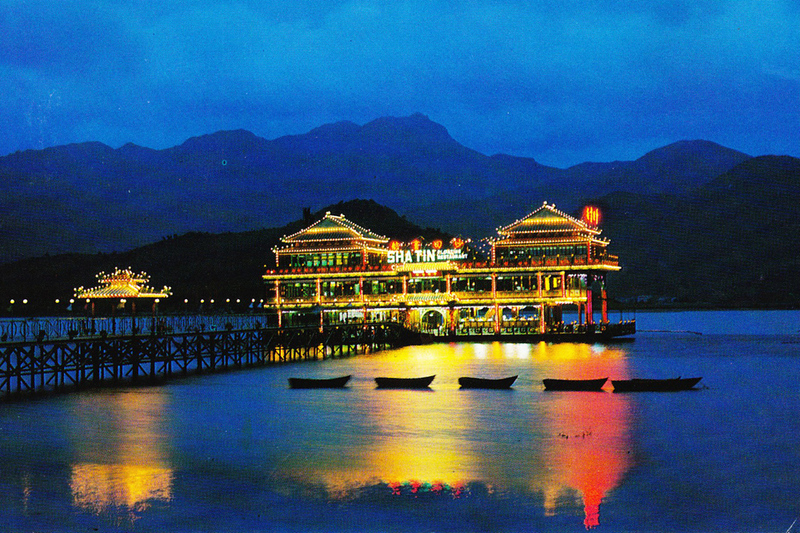 Looking at this postcard I picked up on eBay, I don’t recognize Shatin a’tall. By the time I moved to Shatin, it was built up with high rise jungles and sprawling shopping malls. 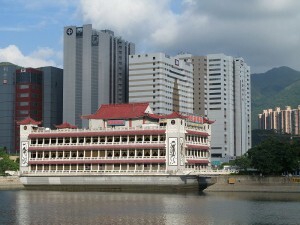 Several times throughout the 90s, I ate at the granite, boat-shaped Treasure Floating Restaurant in Shatin (photo on right), which stood on a different location from the original floating restaurant. My college roommate’s family invited me there for dim sum on the weekends, where we waited outside (up to an hour) before our name was called. And then when my family came to visit, I brought them to the Treasure. We were often the only non-Chinese in the place. In recent years the name has been changed from the Treasure to the Star, but it’s still in the same granite, boat-shaped building. I’ve heard the quality has gone way down. I enjoyed a meal at the above pictured floating restaurant on 22 February 1970 whilst on R&R from serving with the Australian Army in Vietnam. Whilst I can no longer remember the meal I wrote to my parents a week or so later, after I had returned to Vietnam, “Went with a Chinese girl I’d met previously and had a really good afternoon and far better food than had eaten on the tour the previous night”. Most memorable! The meal of the previous evening was also memorable but for all the wrong reasons. Haha! Good memories! Thanks for sharing. It’s so fascinating to hear all these stories centered around a restaurant out in the middle of nowhere back then. I love it! I wonder why Aberdeen was more popular? Shatin would have been quite easy to reach from those popular hotels in Kowloon. Just a train ride up, no? I kind of wish I had at least gone to the Jumbo. Most gweilo in HK laughed at it when I was there. In fact, there was little reason to go to Aberdeen then, although I did go to a temple there to look around. the floating restos were quite a spectacle back in the day. this one in shatin and another in castle peak were visible icons from the road in treks round the new territories. neither, however, had the hustle and bustle of the harbour aberdeen style to add to the experience. i went to the jumbo in aberdeen a few times with friends as a teenager but by then it was a walk-on down a ramp – my dad didn’t like the idea so was never a family event.